Students at Youngstown’s Southside Academy charter school are gearing up for a trip around the world … by walking one step at a time. Approximately 80 elementary students at the Oak Hill Avenue school went home with pedometers after attending a rally hosted by Akron Children’s Hospital and Kohl’s where they learned about a 10-week fitness program the hospital is conducting with them, thanks to a grant from Kohl’s. Over the next 10 weeks they’ll track their steps individually, with a goal of 10,000 per day. They’ll then combine their steps as a group to reach a collective goal to circle the earth, “stopping” at specific countries along the way as they mark their progress. Under Akron Children’s guidance, the school will incorporate the program into recess and physical education classes. Kohl’s presented a check for more than $188,000 to Akron Children’s as part of the “Kohl’s Fit and Healthy Kids” kickoff rally at the school; an event that also included the students participating in various physical activities while learning about the fitness program. Since 2000, Kohl’s has donated more than $4 million to Akron Children’s Hospital. The Kohl’s grant provides free programming and practical resources to the school. 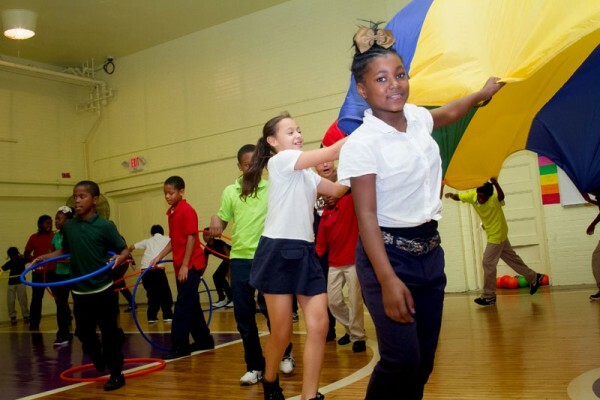 Akron Children’s provides the curriculum, equipment and supplies, and there is no cost to the schools to participate. Megan Palmer, fitness specialist at Akron Children’s who’s coordinating the program with the school, said Southside Academy was chosen because of income need and a lack of organized team sports at the school.